The broker co-op is the new home version of a buyers agent's commission. Agent gets a broker co-op for a new home transaction from the builder as commission. 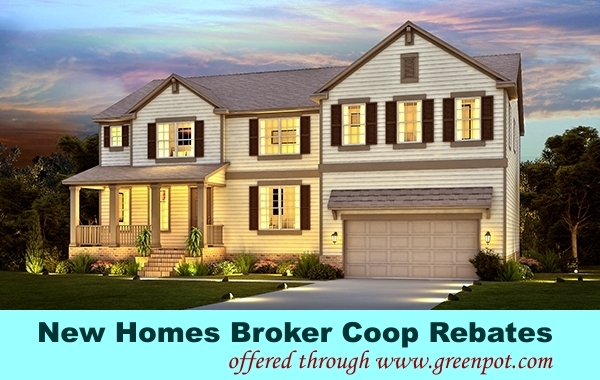 We will rebate part of our broker co-op commission back to the buyer. To qualify for broker co-op rebate program, buyer must sign-in with greenpot agent on first visit to builder sales office together. Do not fill out any registration card or document without greenpot agent accompany. Otherwise, builder will deny broker co-op fee. Remember, do not fill in(or register) any builder document on line or on site without greenpot agent assistance. Today, more than 90% of potential home buyers begin their search online. With all the online tools available today to find homes, it's easier than ever to conduct home searches on your own. If you're a home buyer who's willing to conduct your own searches online, we feel that you should be rewarded for the work and time invested in locating your own home. Therefore, we would offer you a generous rebate. The rebate equals 50% on the amount over $20,000.